Engage in the true spirit of celebration with this Sensational Dutch Roses with Chocolate Truffle Cake that instantly uplifts the mood. These 36 Dutch Roses Heart Arrangement comes with 1 Lb. Heart Shaped Chocolate Truffle Cake. 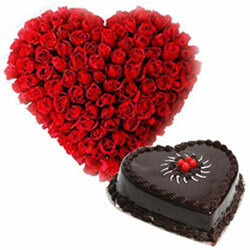 Convey your special wishes with this Heart and Soul Dutch Roses with Chocolate Cake as you enhance happiness in the lives of other people. This incredibly smart Bouquet is presented with 50 Dutch Roses in a Heart Shape arrived with 1 Lb. Heart Shaped Chocolate Truffle Cake. Convey your special wishes with this Heart and Soul Dutch Roses with Chocolate Cake as you enhance happiness in the lives of other people. This incredibly smart Bouquet is presented with 100 Dutch Roses in a Heart Shape arrived with 1 Lb. Heart Shaped Chocolate Truffle Cake. Convey your special wishes with this Heart and Soul Dutch Roses with Chocolate Cake as you enhance happiness in the lives of other people. This incredibly smart Bouquet is presented with 150 Dutch Roses in a Heart Shape arrived with 2 Lb. Heart Shaped Chocolate Truffle Cake.